Chart: If Interest Rates Fall, Markets Also Seem To Fall! 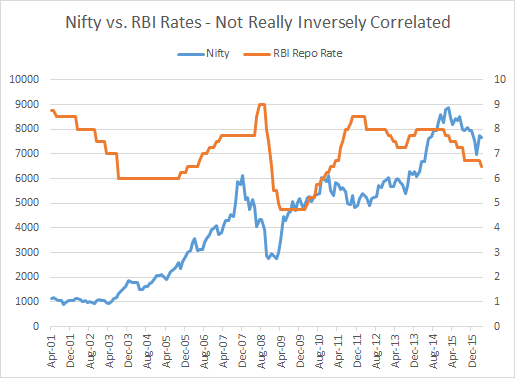 Do interest rates really work opposite to market moves? Apparently, not quite so in India. So it’s not true that when rates go up, markets fall – markets rose while rates were rising in the 2005 to 2007 time frame. And again, in the early part of the rate hike cycle in 2009, the markets rose again. Finally, markets rose even as Rajan came in as the RBI governor in 2013 and took rates up. Also, when rates fell, markets have not exactly gone up either. Rates fell through the 2001-2003 days, and yet, markets were flat. Then they fell (from 9% to 4.5%) starting October 2008, but the markets went to about half. And then again, rates have been falling from Jan 2015. So has the Nifty. You might say, look at the markets 6 months later. But that’s again illogical – markets are supposed to discount the future, and if they did do that then the rate cut would have pushed up markets immediately. While it should be true that rate cuts should help the economy and thus help us recover or such, the theory doesn’t seem to hold up in practice. The problem really is – rates are cut not just because of slowing economy but also because of slowing growth. The very acceptance of that fact (in the manner of rate cuts) might be a pretty good reason why markets decide they aren’t going up. Whatever the reason, don’t believe it for a moment when they tell you that markets will go up if they cut rates.